The purpose of the gastric banding procedure is to restrict your food intake. The band is placed in your upper stomach to create a small pouch there, with a very narrow opening into the lower stomach. This slows down the rate of passage of food and reduces the effective storage capacity of the stomach. Following the banding procedure you will need to change your eating habits to prevent side-effects, such as feelings of bloating and vomiting. Since the purpose of the banding is to help you to lose weight it is also important that you follow the advice given here and that you restrict your energy intake. In particular you will need to avoid high calorie drinks and soft foods such as milk shakes and ice cream. Instead try to take only sugar-free or 'diet' drinks such as sugar-free cordials and squashes. Fizzy drinks may make you feel more bloated, in which case avoid them. It is more difficult to achieve an adequate vitamin and mineral intake on a low calorie diet and for this reason it is recommended that you take a multivitamin and mineral preparation, for example Sanatogen Gold, Centrum of Forceval. These are most effectively absorbed if taken with food. N.B. Vomiting will result if you eat too quickly, if you eat too much or if you do not chew your food properly. Once your body has adjusted, after the first few months post surgery, the frequency of vomiting should reduce. 1. For the first month following surgery, you should puree all food to ensure it passes through the narrow opening between the upper and lower stomach. 2. After the first month solid foods can be resumed but these must be chewed thoroughly, otherwise vomiting may result. 3. Eat 3 meals only per day and do not have extra snacks. Keep to small meals as your stomach cannot manage large quantities. 4. Stop eating at the first feeling of fullness. Even one or two extra bites may cause vomiting. 5. Ensure an adequate fibre intake to prevent constipation. 6. If vomiting is persistant, rather than occasional, after the first few months, revert to a liquid diet for 1 - 2 days before resuming solids. 7. Do not try to induce vomiting to relieve symptoms of bloating or fullnes, this will not help you to adapt to the banding. Day of surgery and next 24 hours: sips of water only (room temperature, not chilled). Day 2 Introduce clear fluids i.e., fruit juice (unsweetened), clear soup, tea (no sugar), sugar-free cordials. Sip slowly. Day 3 Free fluids, i.e., low fat milk, strained soup (not 'cream of' varieties) and coffee. Lunch and Evening Meal: Strained soup, mashed potato (with low fat milk, no butter) and cottage cheese, pureed fruit. Day 6 You may now progress to a puree diet. A liquidiser or food processor to puree foods is best. A potato masher can be used to puree soft vegetables and potatoes. A sieve and spoon can be used to remove lumps, pips and skin. When liquidising food use extra fluid to thin it to the required consistency. Meat, chicken, fish: Remove any skin, bones, fat or gristle. Puree to a paste, then gradually add liquid. Potato: Can be mashed with low fat milk. Liquidise if they are still lumpy. Instant mashed potato is useful and can be used without being liquidised. Pasta: Soft pasta dishes liquidise well if extra sauce is added. Keep to low fat versions of spaghetti bolognaise, lasagne, or ravioli. Vegetables: Cook until tender, drain and puree. The cooking liquid can be used to thin down the puree. Fruit: Puree tinned, fresh or stewed fruit and extra fruit juice to the desired consistency. Use artificial sweetener to taste. Tea, coffee or low calorie drink. After the first month post-op you can resume a solid diet. Because you can still only tolerate small amounts (of well-chewed food) you will need to make sure that the food you eat is nutrient but not calorie dense. This means avoiding concentrated sources of calories which contain few other nutrients, i.e. fat, sugar and alcohol. You should also continue to take your multivitamin / mineral preparation. 1. Growth and repair group i.e. protein foods: Meat, fish, eggs, low fat milk products and beans. Include 2-3 small portions per day eg 60-90grams (2-3oz) meat, 30-60g (1-2oz) low fat cheese. 2. 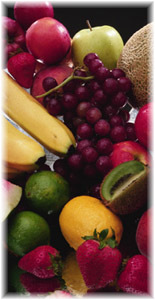 Protective foods, containing vitamins and minerals: All fruit and vegetables. Include 4-5 portions per day (unsweetened fruit juice counts as one portion). 3. Energy foods, includes carbohydrates, fat and alcohol: This is the group you most need to restrict. Choose one small portion (60-90g/2-3oz) of starchy foods at each meal, e.g. bread, potatoes, rice or pasta (choose the wholemeal or high fibre varieties where possible). Minimise fat cooking, avoid alcohol, sugar and puddings, except fruit or low fat yogurts. If you want further advice regarding your diet contact the dietitian via the M.S.G. group or at P.E.H. tel. 707342. A liquid mixture, containing multivitamins, in particular the B complex is recommended during the first 6 post operative months.